I adore circle lenses! In fact, I seem to be addicted to wearing them that it has replaced my conventional contact lenses for more than 2 years. I know it should not replace the conventional ones but I had several problems with them and with circle lenses, I have not experienced any trouble at all (except ripping two of them after a really really long time use). I have tried GEO Angel Circle Lenses among others and it's still my favorite circle lens by far (and I will rave all about it in the next review). I love the dolly eyed look but I opt for the 14mm in diameter lenses as opposed to the bigger ones, though the bigger ones are really very pretty especially for my eye shape. I think that the 14mm diameter circle lenses are just the perfect size if you want a slightly bigger eye that is noticeable but not overly so. Anyway, I ordered from Angelcontacts 6 pairs of GEO lenses to replace my old ones. I have ordered Angel brown, gray and blue, along with OL/Wing gray, Nudy brown and Fresh brown. All of which has a power of -4.00. Yes, I have a really bad eyesight. Attempted another ulzzang look complete with falsies and the OL/Wing gray circle lens and super thick eyeliner. What I like most about circle lenses, aside from giving me that bigger eye effect, is that it's thinner than the conventional ones so its very comfortable for the eye. For this particular lens, the OL gray, the colors are really very light but very visible. It adds a very nice touch to my look. I believe that even with simple or no makeup at all, this lens would really look good. However, this lens wouldn't really give you that super big dolly-eyed look because its only 14mm in diameter and the outer rim is a not really as black as I supposedly wanted and the blacker the outer rim is, the bigger eyes it will give the wearer. 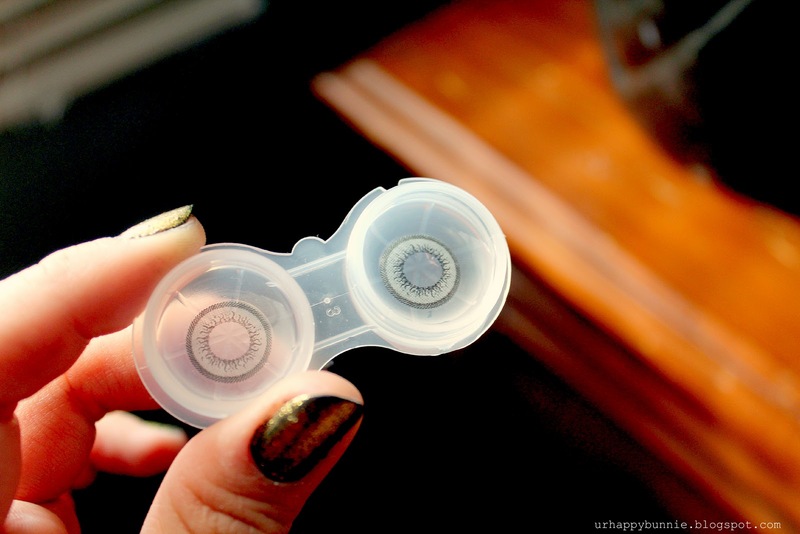 The OL/Wing series circle lenses are very subtle and delicate. It gives the wearer a very misty look that reminds me of Puss in Boots. :) I give this lens an overall rating of 8/10 for its comfort, visibility and for the doe-like final look, but there's something in it that I really don't dig and I think that's because of the light rim. It's just not perfect for me. you're welcome :) thanks for your reply, i will definitely get my eyes checked first! i've had contacts before but no prescription. but i seriously want to buy a lot of circle lenses because of your reviews haha and yes! i'm filipina too ^____^ by the way i love your hair color! I found your blog by chance on the Internet! I loved your makeup, are very beautiful! Oh, and you too beautiful! Your blog is really cool and I'm following! I have a blog makeup too, am a Brazilian blogger and would be very happy if you know and follow too!